We used to think Japan had the best pancakes in the world, but the real champions have been hiding in a Chicago food blogger's kitchen this whole time. 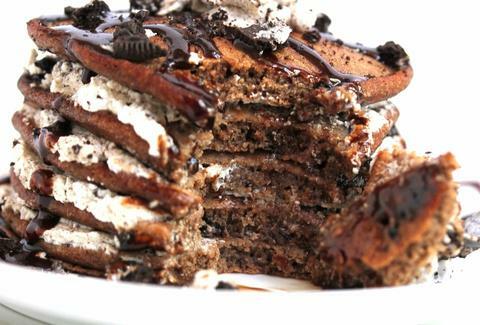 Grandbaby Cakes recently unleashed an amazing recipe for Oreo pancakes, which yields a shortstack of cookie-infused cakes with a whipped cream filling in the middle... plus bonus cocoa powder to take the pancakes to their truest Oreo form. Master this recipe and Roy Choi's Oreo chicken fingers, and you can live like Cookie Monster in the glory days... before the man started force-feeding him veggies. Kristin Hunt is a food/drink staff writer for Thrillist, and currently has a grinder full of crushed Oreos on her desk. Follow her at @kristin_hunt.